As soon as we left the ferry in Picton I realized that the stories were truth. The rain was behind us because this is the sunniest region, nature is different, there’s no so many cars as up North, villages are really far away from each other and the towns we visited are smaller. Nelson was the place for our first night here on the South Island. It’s nice small town on the eastern shores of the Tasman Bay. It attracts visitors with its local arts and crafts scene. This is mostly the summer destination and that’s why at this time of the year the streets were a bit deserted. We found beautiful sandy Tahunanui beach as the perfect spot for an early breakfast before we continue our trip all the way to Christchurch. Christchurch. I was really looking forward to visiting this city but I didn’t really know what to expect. What you can see as soon as you get there is that 22nd of February 2011 was the day which changed everything. Traces of the devastating earthquake are everywhere. While you are walking around all you can hear is the sound of the heavy machinery and all you can see are the workers in reflective vests who are helping to raise the city back on its feet. You can also see that people are trying to make everything as it was before and to live the life as they did before. One of the first steps after the catastrophe was to bring the life back in the centre of the city by opening Re:START container mall. Today more than 50 business are operating there and it’s a very popular spot among the tourists and residents. 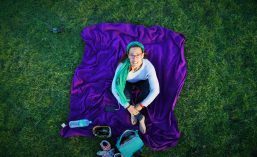 This entry was posted in New Zealand - North Island, New Zealand - South Island and tagged backpacking, christchurch, explore, nelson, new zealand, roadtrip, south island, travel. Bookmark the permalink. Sigh, New Zealand is on my list!